Well what a winter this has been! 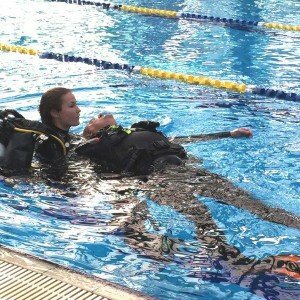 With all the crazy weather and especially the cold, scuba diving in most of Australia, has not been the first thing people think of doing. But for a select few budding PADI Dive Masters at the Dive Shack in Adelaide, diving has been constantly on the mind! Our most recent Dive Master course has been running on the weekends for the past 4 weeks, and with only a couple more components to tick off, our up and coming dive pros are approaching the end. 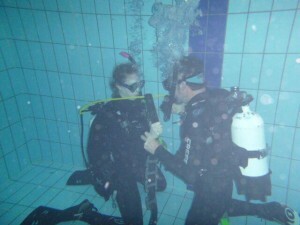 The Dive Master course is known to refine your diving, and help you become a ‘master’ of the basics. 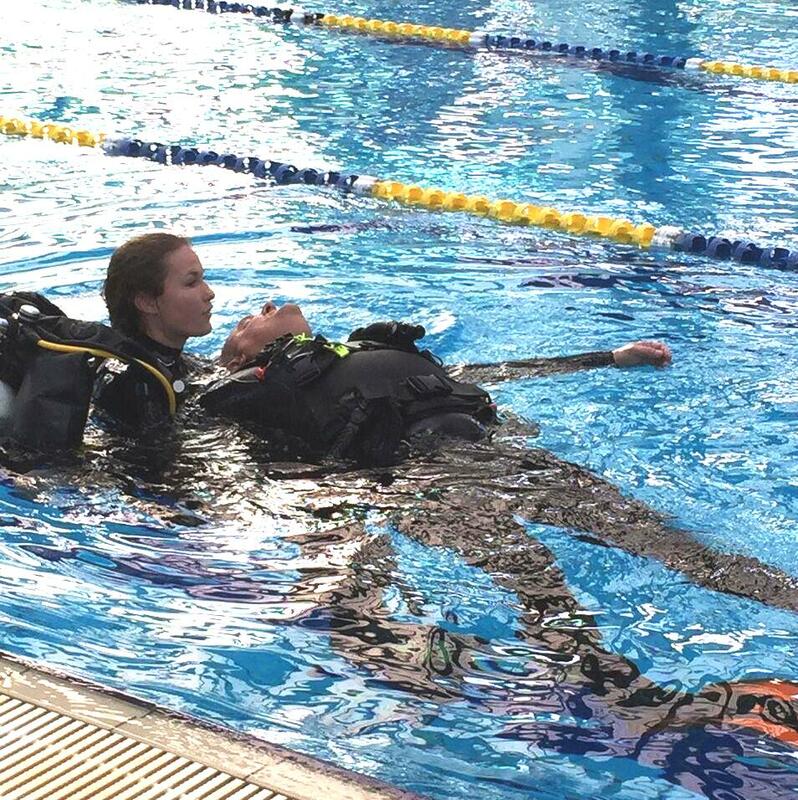 As Dive Master is the first step into being a PADI Dive Professional, and only one step away from being an instructor, the skills that we all learnt when doing our Open Water Course need to be performed to demonstration level, slow, with precise movements. The course begins with pool sessions that test your stamina (since we all know from the courses that we’ve done that you should be fit and healthy to dive).Following the tiring swimming came skill demonstration and mastery, demonstration of a rescue (taking all participants back to when they did their rescue course), and the final thing for the first weekend is the ‘Stress Test’. The stress test is the exchanging of all gear, excluding your wetsuit, while buddy breathing from one regulator. It requires patience, a level head and a lot of team work. A snippet of the new dive masters doing their stress test is shown below. The following weekend saw our dive masters braving the weather and attempting to complete the mapping component down at Rapid Bay. Key word, ‘attempting’; the recent wild weather and constant rain had left the beloved dive location with less than a metre visibility and a surety to lose a buddy. 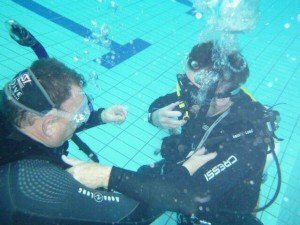 The following day saw them back at the pool and going through the workshops for taking a refresher course and assisting with Open Water Courses. The next weekend saw the soon to be Dive Masters smashing out their exams, and jumping onto the boat to assist with a Deep, Wreck and Nitrox course while completing the deep component of their course. Although the weather was still cold and the water only a measly 12° C the group managed two good dives with some playful dolphins visiting their safety stop. From the mouth of the instructor, Peter Blight, ‘I have never seen them that playful or coming in that close before!’ All in all a brilliant addition to any dive! This weekend will see our Dive masters jumping back in the water to assist on an Advanced Open Water course and practice some of their demonstration skills with an audience. And when the weather permits they will jump in at Rapid Bay to complete the mapping project to finally be ticked off and officially be Dive Masters. If you or someone you know is interested in taking the first step to becoming a PADI Dive Professional, leave your name and details with the girls at the shop and they will get back to you with the next set of dates (rumored to be later this year). Specialty Courses for this Winter!